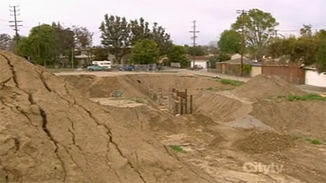 NBC’s smash comedy Parks and Recreation begins with the story of Andy Dwyer falling into a pit. No seriously he falls into a pit. It sounds like about a third of the software projects I’ve worked on. So your team fell in a pit. Or perhaps you have a dead fish on the table. Step one: Don’t just do something, stand there! I frequently get phone calls asking for a contractor or consultant to come help dig the company out of the pit. To brag just a little bit, people come to me with reasonable problems, waving modest and larger piles of money. How do we make sure it doesn’t happen again? In six months, a year or two, how do make sure there isn’t a call to another consultant, another contractor, another call to hire some great savior as a full-time employee to fix this mess. So stop. Figure out how you got into the mess. At this point, you’ll be tempted to pin the blame on someone else. Some leader, over a golf game, promised a delivery date to close a deal, setting up a mountain of pain while earning a commission in the bargain. The date is fixed, the feature list is complete, the software “must” work, all of it outside of our control. Hey man, we’re the victim here. Somebody else built a pit and we fell into it. In that case, allow me to ask: Why is this your problem? To borrow a line from Jerry Weinberg, this isn’t a crisis, but it might be the end of an illusion. Working harder, denying reality and feeling bad about ourselves won’t fix this. If that’s the case, go home at five. Be happy. If you can, help someone else end the illusion. The Lean and Toyota Kata Literature talks about the idea of True North – the direction your organization needs to go to improve. Do you want to release more often? Have fewer defects? Deliver more working software? Make and keep commitments? That works when I fly delta and they offer me peanuts or pretzels. It doesn’t work in a world with limited resources. To invest in one thing is not to invest in another. Faced with people who won’t decide, you get to do a powerful thing: Decide for them. Given a group with no direction, my choice is usually to pick “making and keeping commitments”, as it is a form of integrity. Lacking leadership, you pick true north. Tell ’em you’ll “steer thata way” until you hear direction otherwise. Imagine the senior executive, dropping my the bullpen, giving the rah-rah speech about the project. The one you know is a dead fish. You know what that executive does not have? He doesn’t know if the project is salvageable. If he did, he wouldn’t be giving the speech. He’d be talking about what to cut, how to structure the work, and maybe, just maybe, margin of confidence. He doesn’t have the data. So get it for him. Sure, pull out velocity from Jira. If you can, just look at the number of stories finished by sprint. Also pull out cycle time – the average time a story takes to go from started to done by work-stream. Then consider how many work-streams you have, and how many stories that would predict. We could talk about distribution curves, the problem with averages, and standard deviation. For now, though, figure out how much data people have and go one level deeper. Once you have the data, people will ask you what to do. Pick any reasonably large project and there will be dumb stuff you don’t need to do – or at least, don’t need to do now. My personal favorite was the ERP upgrade that went up January first. The monthly reports didn’t really need to be due until February first, and the quarterly reports weren’t due until April first. There are always things like that. The problem is the folks who think they can have everything. They’ll realize it is an illusion sooner or later. Your job is to provide them the information to make the decision. At least, it is if you want to position yourself as an strong, independent advisor. If you’ve followed along then you recognize an actual pit exists. You have the data to show that it exists. You know the rate people are digging out, when the team will come out, and what has been promised. When people have a problem with the deadline, you can show them projections, and they can argue with the projections or suggest solutions. Either way, this isn’t your problem. But you might be part of the solution. LOL, and the first time you tell a CEO "No" will be your last day at that company! True. You never know what promises may have been made higher up. Your CEO may have promised you biggest customer results on a certain day...Not meeting that deadline may cost the company in more ways than one.. Unfortunately that is the nature of this business...A lot of the ones doing the work are given the deadlines without checking the current project load on the department and other deadlines already in place. In that case what do we work on ?